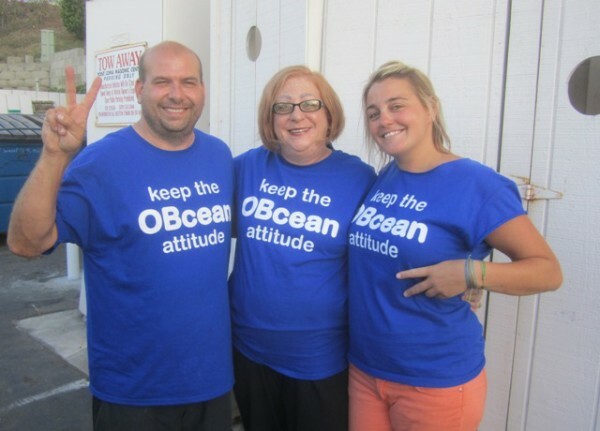 Gio, Trudy and Marin sport the new “keep the OBcean attitude” T’s in support of the OB Community Plan. OB planners and their supporters are in a final push in the petition drive in support of the OB Community Plan. Petitioners have gathered about 1700 signatures at this point, announced Gio Ingolia at the OB Town Council meeting last night, June 25th. Petitioners will be out in force at OB’s Street Fair this Saturday, June 28th. It’s the 35th anniversary of the OB annual event. Petitions will be available throughout the Fair, including at the OBTC Chili Cookoff booth, at the OB Mainstreet Association booth, at the OB Historical Society table, and at the Point Loma Democratic Club booth. The Community Plan comes before the full City Council on Monday, June 30th. OBceans are being urged to attend the hearing, which begins at 2pm in Council Chambers on the 12th floor of City Hall, 202 C Street in downtown San Diego. In addition, OBceans are asked to buy the new, blue T-shirt in support of the Plan and to wear them at the Council meeting. 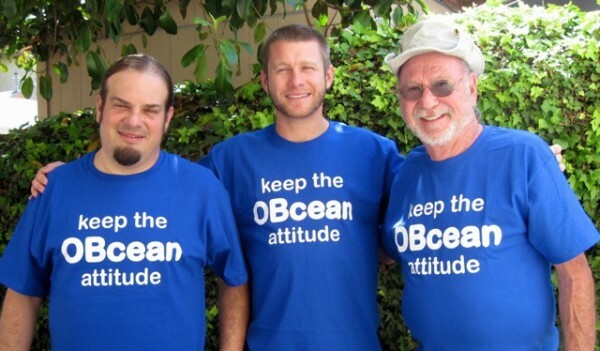 The shirts are emblazoned in white letters that state: “keep the OBcean attitude” . Organizers have hopes that the City Council members will see a sea of blue when they look out over the audience at the hearing. The shirts will be for sale also at OB Street Fair, and daily at Dog Beach Dog Wash for $10 -cash 0nly. Co-chair of the group that has worked with the City over the last 12 years in writing up the Updated Plan, has promised, that if one wears the shirt to Monday’s City Council Meeting, they’ll get $5 cash back. OB planners feel confident that the Councilman for OB – Ed Harris, and Mayor Faulconer – both support the Community Plan. At the meeting of the Sub-committee on Monday, June 23, the City planner Teresa Millette described how her office was informed by the Mayor’s office to retain the original language that the OB planners and the City Attorney’s Office agreed to. This was a good sign to the planners as it indicated that Faulconer – who of course used to represent OB – was on top of the key issue in the fight to have the Plan approved by the Council. Plus at a recent Leadership Breakfast in Ocean Beach attended by Councilman Harris, he also indicated in so many words that he supported the community – and by implication its plan. Every OB community group has endorsed the Plan. So, please – plan on attending the City Council hearing on Monday, June 30th at 2pm. There’s also an online Petition. And there’s a facebook page for folks pledging to go to the City Council meeting. Steven, Brandon & George urge OBceans to join them. I picked up a little over 20 signatures to send your way, and I’ll definitely grab one of those shirts. If you’ve got 1700+ already, I’m sure we’ll surpass the 2000 mark by the hearing. Great work Gio, et al…See you guys Monday afternoon! I sent my email to council and mayor as a former OBPB chair supporting the community plan as written. Wish I could be there for Monday’s meeting.